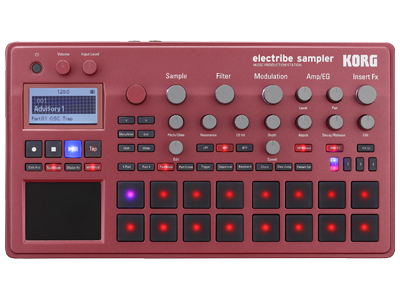 The electribe sampler lets you load any sample from an SD card and use it for producing beats. There are 499 user sample memories in which you can store original waveforms that you've created using waveform editing software or sampled sources provided by developers. Of course you can also connect a record player or instrument to the audio in jack and sample from it. You can edit the loaded waveforms in basic ways such as changing the start/end point or pitch, and even time-slice them. The attack portions of a phrase can be detected and sliced automatically, allowing you to play them back at a desired tempo without significantly changing the sound. Sliced parts can also be assigned to specific steps or parts and triggered individually. There's also a resampling function that lets you sample a sound that you processed, a phrase that you constructed, or your realtime performance on the electribe sampler. Additional possibilities open up when you use this in conjunction with time slices; you can change the order or rhythmic groove of a phrase, or turn a multiple-part phrase into a single sample, allowing you to add phrases using the newly-free parts to create an even more complex pattern. 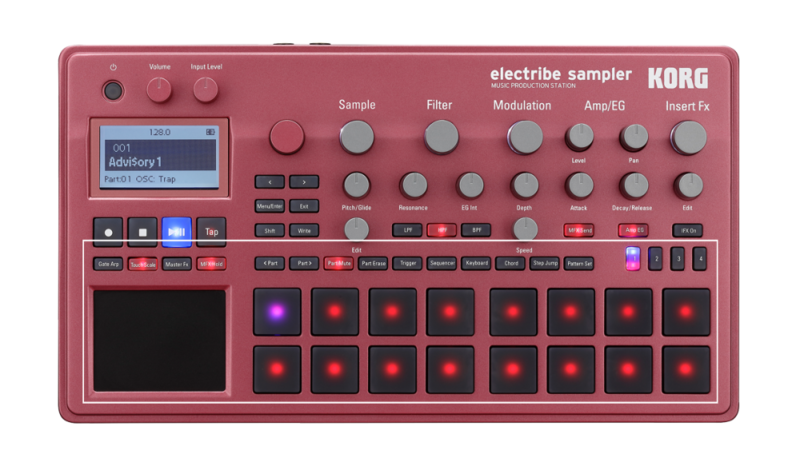 The electribe sampler contains numerous production-ready sampled sources that you can use as soon as you power-on the unit. 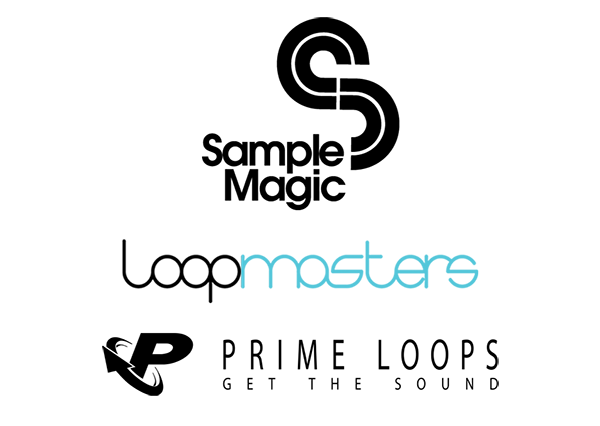 It provides a range of sampled audio sources suitable for any style of music, including 179 Drum/Perc samples such as Kick and Snare sounds that are indispensable for creating beats, 33 loop-type samples as you would expect from a sampler, 31 voice-type samples, 37 sound effect samples, and 123 more instrumental samples containing hits, shots, or phrases of Piano, Organ, Brass, or Guitar. Based on these samples from collaborators famed for their high quality, such as Sample Magic, Loopmasters, Prime Loops, and Raw Cutz, you can create the exact sample sounds that you want. In addition, the electribe sampler provides 16 analog modeling oscillators and three filters, which you can use as accents for your sample-based music productions. The modulation that's so important for sonic creativity is designed to be easy for anyone to control. Modulation sources such as EG and LFO are available paired with a modulation target such as Filter Cutoff and Oscillator Pitch; simply choose from 72 modulation types and then adjust the speed and depth to apply the type of modulation that you want. 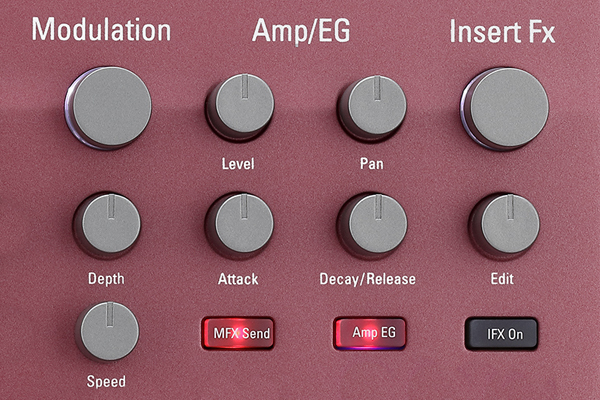 A total of 32 insert effects are provided, including compressor, overdrive, and EQ. Effects can be specified individually for all parts, letting you have uncompromising control over the nuances of your sound. Velocity-sensitive trigger pads and X/Y touch pad work together; input notes or X/Y-generated phrases to bring your ideas to life. 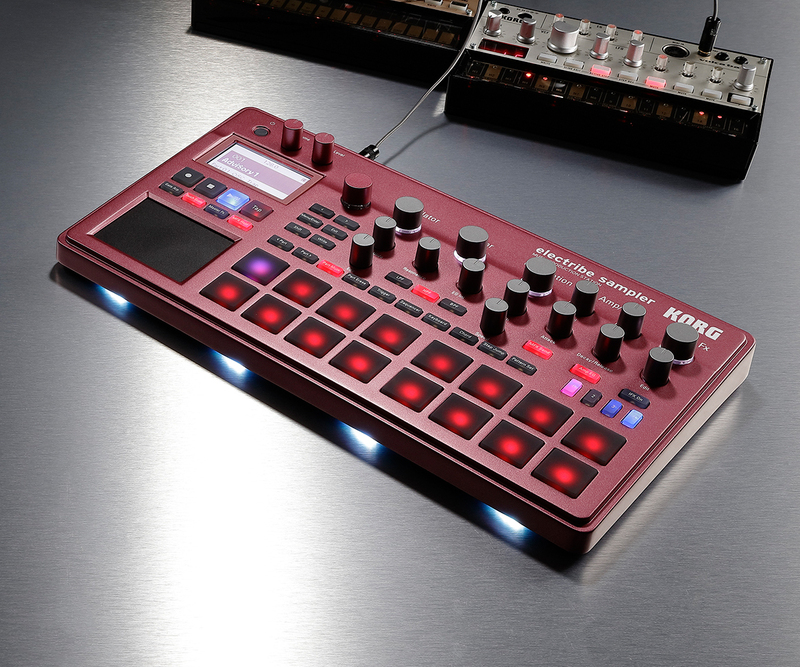 The electribe sampler allows you to input up to 64 steps (16 steps x 4) for each part (sound). You can create beats by combining up to 16 of these parts per sequence pattern. 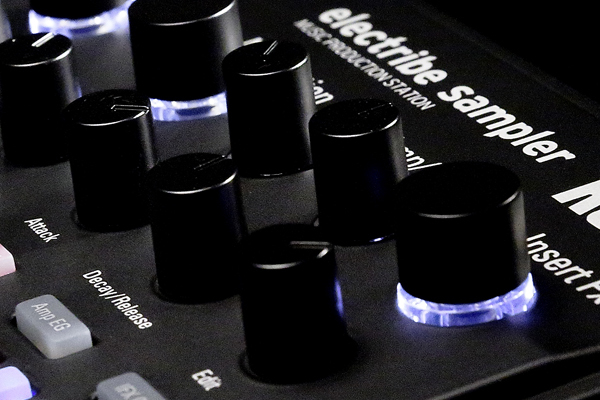 The step sequencer of the electribe sampler allows extremely intuitive pattern production. The 16 trigger pads and the touch pad with XY control provide a variety of modes that instantly reproduce the phrases created by your ideas, allowing rhythms and phrases to be input without requiring musical knowledge. This mode is ideal for auditioning the sounds before you enter a sequence. The trigger pads are velocity sensitive, and by striking them rhythmically you can input drum and percussion patterns that have a sense of life and movement. This mode is ideal for inputting rhythm. You can step-record by using the 16 trigger pads which correspond to 16 steps. This method makes it easy to see the timing of the notes, and can also be used for editing after realtime recording. This mode is ideal for playing melodies. 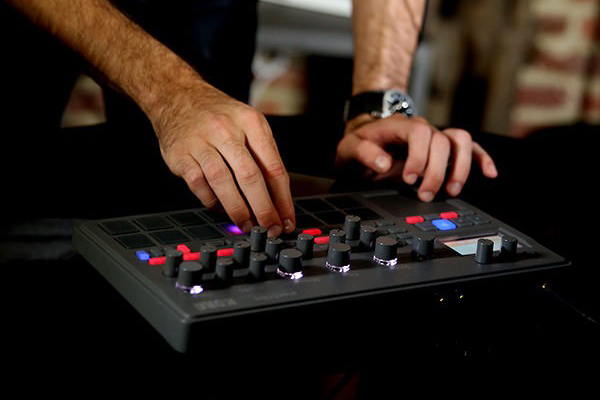 The 16 trigger pads act as a keyboard, allowing you to play melodies according to the scale/key settings. You can also change the octave. This mode is ideal for playing chords. Simply by pressing a trigger pad, you can easily play chords according to the scale/key settings. This mode is ideal for inputting bass riffs or hi-hat parts with a sense of groove. While playing the trigger pads or the touch pad, you can use the gate arpeggiator to generate rhythmically detailed notes. This mode is ideal for those who are not comfortable with playing melodies on the keyboard, or as a way to generate some inspiration. Simply by moving your fingertip over the touch pad as on the Kaossilator, you can freely produce phrases according to the specified scale/key settings. 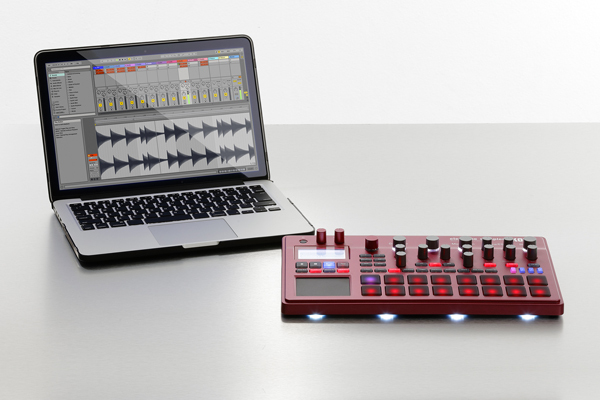 The electribe sampler seamlessly lets you edit sounds and input sequences in parallel. Input a sequence and edit the sound while listening to it. Efficient beat-making that would be difficult using just a DAW becomes stress-free on the electribe sampler, which allows you to think at the same speed as the music you're hearing. The motion sequence function records and reproduces knob movements. You can add time-varying movement to looped sounds, creating a completely original flow of sound. The last step function lets you change the number of steps in the selected part. You can create unexpected and unconventional rhythms by specifying a different number of steps for each part. This function is also useful when you want to instantly change the character of the song, or when you want to adjust the length of the song. You can choose from a total of 25 groove types that reproduce the playing technique and rhythmic feel of percussion instruments such as congas and bongos. By selecting a groove type for each part and adjusting its dynamics, you can create a natural-sounding rhythmic feel that's liberated from the 16-step grid.